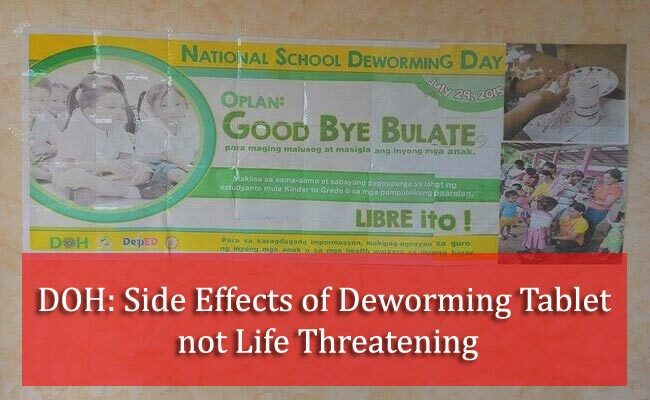 Amids the controversy, Department of Health stood its ground that the medicine distributed for the nationwide deworming of students in public elementary schools are safe and definitely not expired. According to DOH Secretary Janette Garin, as reported by People’s Tonight, the Food and Drug Administration and World Health Organization had even inspected and approved the Albendazole 400mg to ensure the safety of the students. Nausea and vomiting are the common side effects of the tablets, while those students who were said to have lost consciousness might not have eaten a meal before taking the medication. Some students might also have a serious case of worm infestation that might have cause stomach pains. Others did not chew the chewable tables and just swallowed them, which might have caused them to vomit. Garin shared that the tablets were freshly delivered and were carefully inspected by the DFA and WHO. In a report published by Philippine Star, Vicente Belizario of DOH clarified that the Albendazole’s side effects are not life threatening. The benefits still outweigh the mentions side effects. Belizario even said that parents can choose whether to let their kids to be short, thin and poor in school performance or let them be dewormed and experience non-life threatening side effects but be healthy afterwards. He also clarified that the tablets given to the children are not expired. The tablets will be expiring in 2017. He also shared that they already identified the person who had slipped in during the program and gave a parent the expired packet of Albendazole. The brand name is different. A total of 3,637 students were reported to have experienced the side effects of the medication, yet the total number of school children who had taken the tablet was 8.1 million. The number of hospitalized students is only a small part (0.45%) of the total number as cited by DOH Spokesperson Lyndon Lee Suy. The benefits out weighs the non-life threatening risks. Eulyn was a Public Health Nurse 1 under Registered Nurse for Health Enhancement and Local Service (RNHEALS) project of DOH in 2014. She currently works as a Public Health Nurse 1 under the Nurse Deployment Program of the Department of Health Center for Health Development 3 (DOHCHD3) in Iba, Zambales.